The website holding Alyse Hanssen's missing file has been found by GuesstimateJones. USGX8810B467233PX.com contains a single blank login screen. The domain was created in February, which predates the DVD release or any of the sword updates. 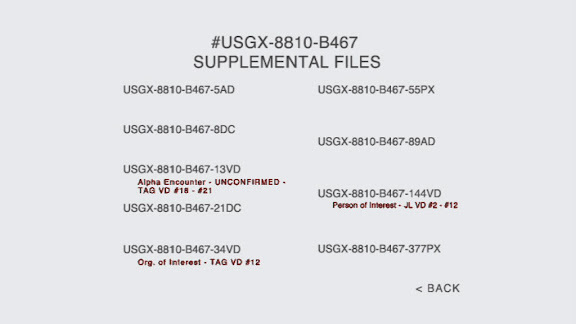 All of the links begin with USGX-8810-B467, and end with a number and a letter code. The numbers all follow the fibonacci numbers. However the number 233 is missing from the sequence. USGX-8810-B467-233PX appears to be the missing file, and USGX8810B467233PX.com appears to be where that file is. Now.... what is the username and password? male - A hidden word on the MTH poster. Let me know if you figure it out! As an added bonus, I'll give the first person who figures this out AND emails me, a CloverfieldClues limited-edition DVD. * Special thanks to ABPDOfficer106 for noticing the Fibonacci numbers! Man, I'm just wondering what's inside of that website. I know we're supposed to be looking for a missing file. But what exactly is it that we'll stumble upon when we get through the log-in page? Another video? A short/long piece of cryptic text? It could be anything, haha. I'm eagerly awaiting to see what comes up. I've had no such luck with the log-in page, though. So many username/password combinations to go along with. Anyone else have any ideas or suggestions? I just thought of something. It might be helpful to this, it might not be, but either way this page made me think of this. What if Randy and The Whistle Blower are/were the same person? It could be possible. has anyone noticed alyse's font has gone back to normal again? Theyre all pictures, therees 3 of them, but the 3rd is kinda different. If Dennis asks me to explain i will. Its up to him, but honestly, GREAT WORK ALL OF YOUS! even for figuring out the site!! Tell us! Tell us! Please I'm DIEING to know what those pictures are! may? haha, guess im just the first as far as you know? sweet, its still an awsome feeling. I guess this would mean "user account" followed by a record ID number. Also, the "mod_auth_intel_store" and "multiport scan" at the bottom of the access page is a message for us to do a nmap port scan, and look for open ports. They are encouraging us to try to get in without a username/password. The poster name can be altered to say "ganu hid one" or "ganu hide on" I posted this previously, but seemed to go unnoticed, could possible be the password? thx for changin it Dennis. You don't need a login name or anything, just go here and see the 3 pics. One is a report of something happening and the other 2 are who knows what, open for interpretation. The user account number is in reference to the Google Analytics account that paramount set up to track the activity on the website. The username has to be a top exec inside Tagruato. Only tagruato would want to keep this a secret and who else would take these pictures; and their logo is on the rig in one of the pictures. IDK if it means anything, but one possible configuration of OUDNANIEHG contains DNA, HUGE and ONI. Might those be related to Clover? I'm not sure. did anyone else realize it says person of interest and it says JL VD #2-#12...could it possibly stand for jamie Lascano videos 2-12? that would make sense to me if this is a tagruato linked site and they have done something to teddy...anyone agree?